In a medium saucepan over medium-low heat, combine wine and cream; let cook for 4 minutes or until bubbles form around edges of pan. Whisk in sugar and let mixture come to a boil; whisk often to make sure sugar is completely dissolved. Once boiling, reduce heat to low and whisk in butter. Remove from heat and whisk in chocolate, vanilla and salt; let cool until warm to the touch and not hot. 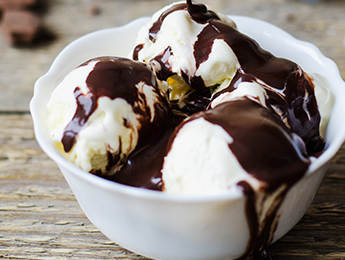 Serve over your favorite ice cream.